100% natural, handcrafted 2 oz Artisan Spice Blend. Mix of veggies, herbs and spices... simply the best dip mix! 7x4" - 2 oz biodegradable cellophane in kraft cardstock sleeve with twine hanger. 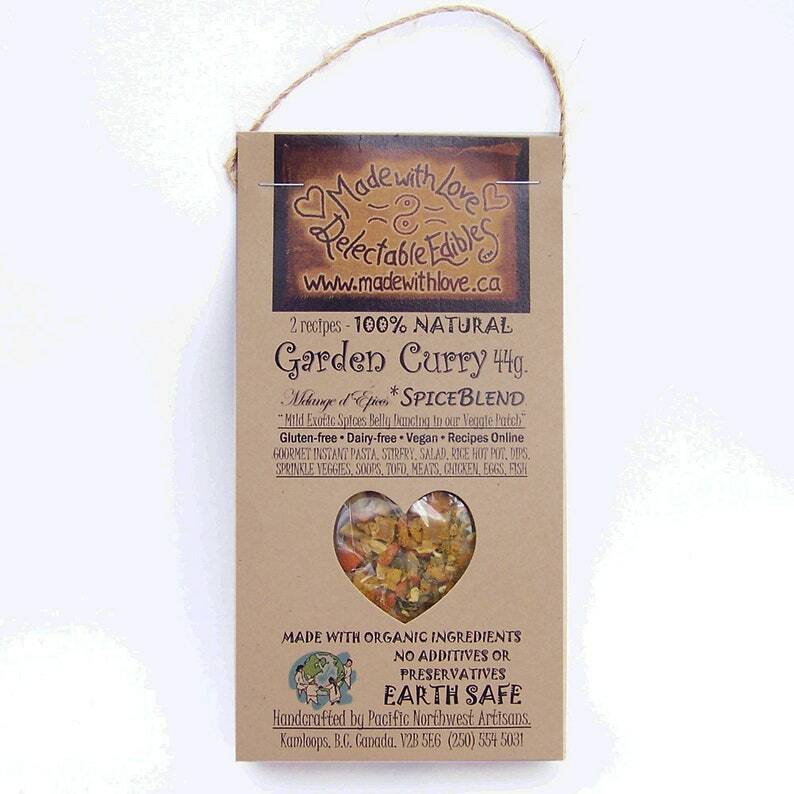 One of our most popular Spice Blends, Garden Curry appeals to all taste buds, even many who "think" they dislike curries, spicing up many previously "curry-free" relationships! A rich mild blend of sweet & savory curry spices with a sweet mix of garden vegetables but not too much heat. We call it a passport to the land of curries, loved by traditional tasters and those with a taste for the exotic. Fabulous in a whole grain hot pot, stirfry or soup. We love it in vegan coconut cream, cooked in a quinoa, on chicken, fish or as a creamy curry pasta! A rich & flavourful sunshine cream in dips or creamcheese! INGREDIENTS: dried: spices, herbs, carrots, peppers, onion, garlic, potatoes, leeks & cabbage, raw turbinado sugar, sea salt. Each 100% PLASTIC-FREE biodegradable cellophane package will make 8 generous, "10 minute" pasta bowl dinners with a rich gorgeous real cream sauce or a decadently divine clear sauce. Recipes Online... with generous Big Bowl servings like real people eat! Made with Love Spice Blends are "All in One Package" Dip Mix / BBQ Grill Rub / Pasta Sauce Mix / Salad Dressing Mix / Balsamic Bread Dip with recipes on every bottle. Just add a couple of fresh ingredients and Voila! Tell all your friends I made it myself - its Made with Love. 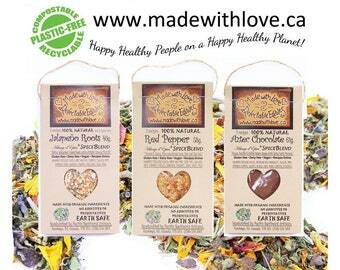 All Made with Love Spice Blends are gluten-free, dairy free, and vegan. All products are Made with Love with 100% natural, Non GMO, non-irradiated ingredients. We work hard to source RAW & organic fair-trade ingredients direct from small organic farmers and everything we create is made lovingly by real human hands. 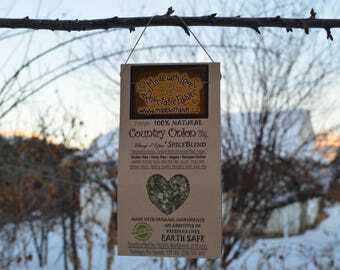 Made with Love is Earth Safe: natural, hand-crafted, 100% Plastic-Free packaging, No GMOs, No Silicon Dioxide, No Preservatives, No Additives, No anti-caking agents and everything is ethically sourced with the long-term health of our bodies and planet in mind. "Fantastic ....everything perfect...will definitely be purchasing more"
"Delicious! Super fast delivery too!" "Amazing! I use these all the time!!! I highly recommend this shop"
"OMG, this is the best stuff to come in to my life since sliced bread!! I absolutely love this stuff...I use this mix on and in everything.....especially love it on pork loin chops... they come out mouth watering!! Highly recommend that everyone try this...!" "These are the best dip mixes I have ever tried! ...so awesome since they are organic and chemical free! I sell them in my store along with chip and dip servers and everyone is really loving them. I sold out of my first quantity of 36 in a very short period of time and have just reordered! I was worried about the price I would have to charge for them but that didn't matter in the least!" "The recipient of this gift was thrilled... so glad i bought it and would definitely recommend to others. Shipping was right on time:)"
"Fantastic! Fast, easy and delicious. The product is so versatile, it can be used so many ways. Highly recommended." "Beautiful and so unique. A lovely gift! - Delicious - Love it on grilled veggies!" "love it ! on my pasta , chicken, fish, salad, and dips. mmmmm..."
Packaging and website http://www.madewithlove.ca is filled with recipes and everyone can watch Colin and Alexandra online as they teach us how to make Easy Real Whole Food Fast! Made with Love makes cooking simple and delicious, so anyone can become an eco gourmet chef in no time! Made with Love Krema Dips are incredible: just mix 2 Tbsp with one cup of Mediteranean or Greek Yogurt for knock your socks off super yummy dip with all the taste of a sour cream and none of the guilt. OR choose 1 cup of sour cream and mayo as your base, OR creamcheese OR hummus, OR a tofu and nayo vegan base from our website. All nine of our Spice Blends are spectacular dip mix! When you've got Love, Life gets Simple.